First, make your reservation on our Reservations Page for your group. Then, if your group numbers 6 or less, typically, you will order on an individual basis the (Gourmet Cooler Bag Lunch) or groups 7 or more (Family Style Gourmet Group Lunch). Click on the appropriate tab below to complete your menu selections or call us at 1-855-551-WINE. All orders must be complete and finalized no later than 5 days prior to your reservation. A 20% deposit is required on all reservations. Balance payable in CASH or 3% Convenience fee added. 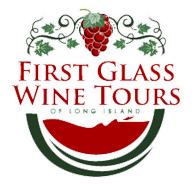 Copyright © 2016 First Glass Wine Tours Of Long Island. All Rights Reserved. Copyright © 2019 First Glass Wine Tours of Long Island. All Rights Reserved.